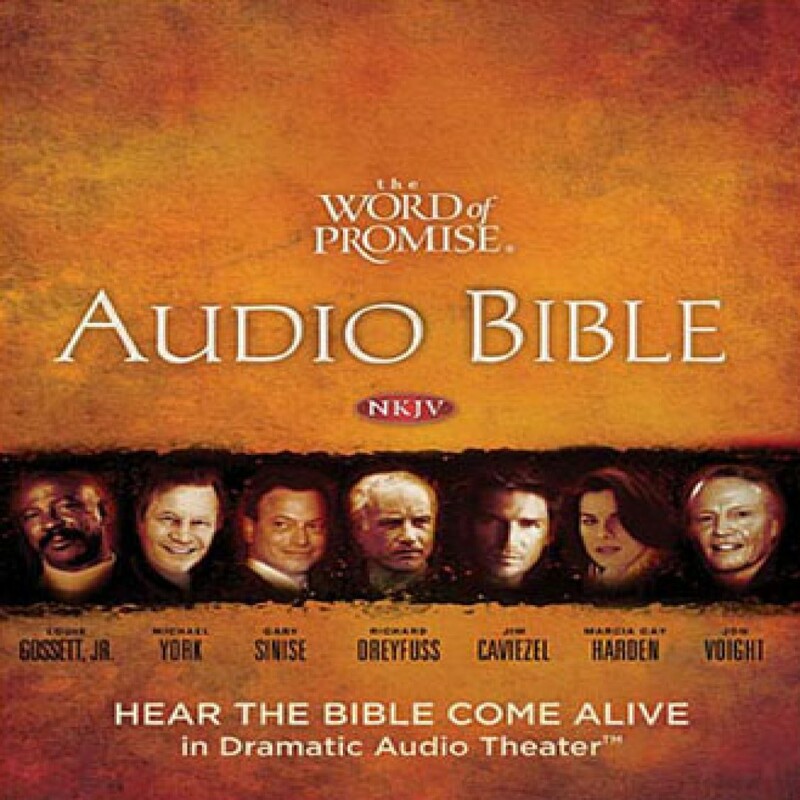 The Word of Promise Audio Bible Download - Christian audiobooks. Try us free. Everyone should own a copy of the Bible in audio format so they can be blessed with the Word on the go. There are many others, however, this one is amazing in that it has many different voice actors and famous names lending their talents. Sound effects and the variety makes this a cut above the usual offerings in that it is adds to the realism. I love listening in the car, around the house, or anywhere! Whether you agree on the chosen voices, the Words are what matter and that is the best part. If you purchase any audiobook make it this one. Just like the Good Book you will enjoy it forever! This is fantastic. So much thought obviously went into this. Cherubim sound different than angels (כרובים is arguably derived from Hebrew meaning "as the many" and are possibly composite beings, and the voices reflect this view.) The pacing in the one of the narratives in Zechariah mirrors the underlying Hebrew. The voice actors all throughout are compelling and well-chosen, and the music is very good. This is the best audio Bible I have ever heard and will be a lifelong companion. This is better than the NLT dramatized audio bible with Mike Kellogg, in my humble opinion. Love all the sound effects as well as the dramatic reading by all the different actors. Thank you for organizing it into each book. Audible only has chapters and parts making it nearly impossible to navigate which book you want to listen to. Well done! Beautifully done audiobook!! Each person speaking has a different voice which kinda makes sense.. Absolutely one of the best audio books I have come across...they even will have different voices for different people speaking so you get a better idea of who is speaking.. I would rate this even higher than the Inspired By AudioBible series..
A am a huge fan of audio Bibles and I listen to them practically daily. I have had several and previously my preference was always for the Alexander Scourby versions (still excellent), but the Word of Promise version has got to be my favorite now. So incredibly well made, the dramatization and sound effects really help to immerse the listener. I personally believe that audio bibles are an essential item for any believer since they create so many opportunities for us to soak up more of the word of God, I would encourage anybody to get an audio Bible and as far as which one to get you will not go far wrong with the Word of Promise audio Bible set. I do enjoy listening on the go!